One would not expect this household appliance to need much organizing. 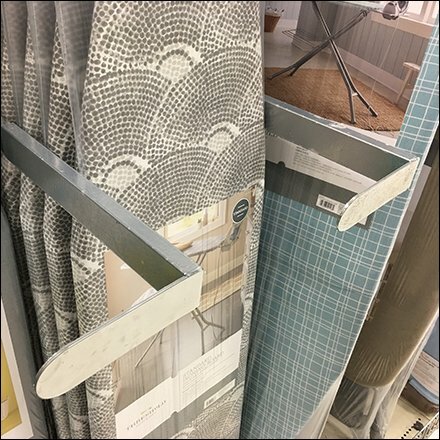 Nevertheless these L-shaped, Ironing Board Wrap-Around Dividers aid directly in the merchandising effort. The built-in Productstop Ends are a great safety feature too. A wack in the head by a falling ironing board would be no minor occurrence. See that L-shaped dividers work with both front-to-back as well as side-to-side display and sales. These Ironing Board Wrap-Around Dividers seen at Target.